This is not the kind of comment you’d expect to hear from British informants when asked about the acceptability of particular disputed usage items, given the lack of formal grammar teaching in UK schools since the 1960s and 70s. It is, however, a typical comment made by native speakers of Dutch according to Wouter van Wingerden, whose “Maar zo heb ik het geleerd!” De waarheid achter 50 taalkwesties (van Dale, 2017) has just come out. I’ve known about Wouter’s project for a while, and rushed to my local bookshop as soon as I read about the book’s appearance in Onze Taal, a monthly magazine that deals with all kinds of language issues (always a great read). 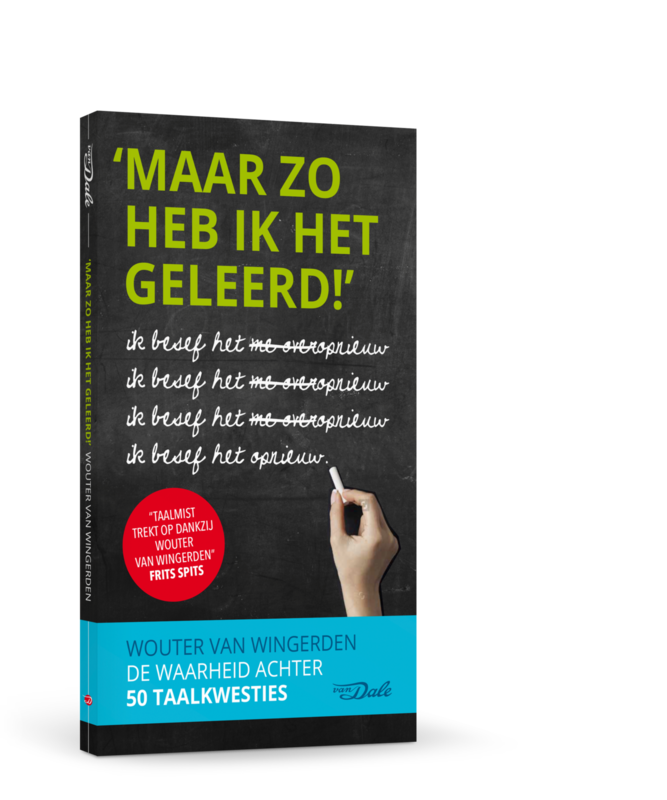 Wouter used to work for the magazine as a language adviser, and decided to put his experience to good use by writing this book. On which grounds? (a selection is offered) or: Which of the variants do you prefer? Five more items can be found online. I think the book (which is very readable) is an excellent example of how a prescriptive approach (sound usage advice) can be combined with a descriptive one (basis in an elaborate attitude survey). And in doing so it provides highly valuable data, such as different preferences between Dutch and Flemish native speakers. I also think that if used properly used in Dutch schools (school teachers both make up an important section in the survey population and are approached directly in the book itself), it could give a boost to the teaching of Dutch in The Netherlands (a subject which, for unclear reasons, currently suffers from very low prestige among secondary school children in this country). Congratulations, Wouter van Wingerden, I expect the book will do extremely well. It should, moreover, serve as an example for all those thinking about embarking on a new usage guide project.